I have had a love affair with waffles lately; can’t get enough of them! Or perhaps it’s the butter and real maple syrup that they get dowsed in before I eat them! 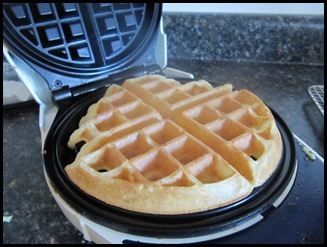 We have a standard Hamilton Beach Waffle Baker. 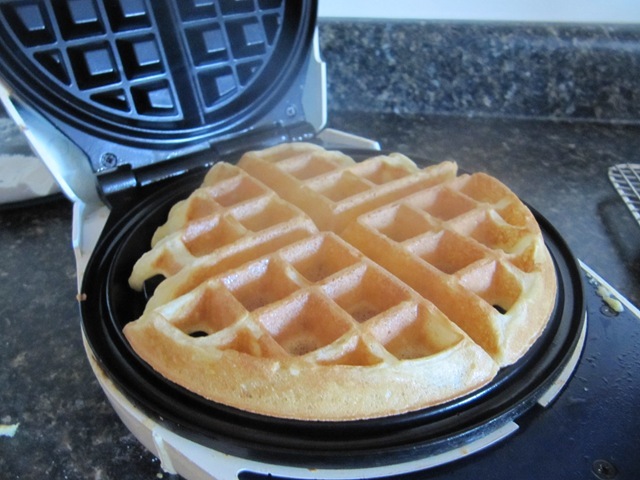 It works good enough, though I would like a double waffle maker someday. Anyway, my favorite waffle recipe is a pretty basic one from the instruction leaflet that came with our waffle maker. Whisk flour, baking powder, salt and sugar. In a separate bowl, beat egg whites until stuff. Add milk and egg yolks to the flour mixture. Stir until smooth then add oil and vanilla and mix well. Fold egg whites into the batter. Makes approx 4-6 waffles.